The German high court recently ruled that Germany must audit its gold reserves held in foreign countries such as the U.S., England and France. And German inspectors will actually travel to the New York Federal Reserve Bank’s gold depository and the Bank of England to inspect their gold. If the Western central banks are indeed leasing out their physical reserves, they would not actually have to disclose the specific amounts of gold that leave their respective vaults. According to a document on the European Central Bank’s (ECB) website regarding the statistical treatment of the Eurosystem’s International Reserves, current reporting guidelines do not require central banks to differentiate between gold owned outright versus gold lent out or swapped with another party. The document states that, “reversible transactions in gold do not have any effect on the level of monetary gold regardless of the type of transaction (i.e. gold swaps, repos, deposits or loans), in line with the recommendations contained in the IMF guidelines.”6 (Emphasis theirs). Under current reporting guidelines, therefore, central banks are permitted to continue carrying the entry of physical gold on their balance sheet even if they’ve swapped it or lent it out entirely. You can see this in the way Western central banks refer to their gold reserves. The UK Government, for example, refers to its gold allocation as, “Gold (incl. gold swapped or on loan)”. That’s the verbatim phrase they use in their official statement. Same goes for the US Treasury and the ECB, which report their gold holdings as “Gold (including gold deposits and, if appropriate, gold swapped)” and “Gold (including gold deposits and gold swapped)”, respectively (see Chart B). Unfortunately, that’s as far as their description goes, as each institution does not break down what percentage of their stated gold reserves are held in physical, versus what percentage has been loaned out or swapped for something else. The fact that they do not differentiate between the two is astounding, (Ed. As is the “including gold deposits” verbiage that they use – what else is “gold” supposed to refer to?) but at the same time not at all surprising. It would not lend much credence to central bank credibility if they admitted they were leasing their gold reserves to ‘bullion bank’ intermediaries who were then turning around and selling their gold to China, for example. But the numbers strongly suggest that that is exactly what has happened. 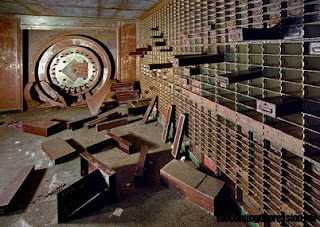 The central banks’ gold is likely gone, and the bullion banks that sold it have no realistic chance of getting it back. This may sound like a conspiracy theory. But the banks have already been caught raiding allocated accounts. And governments have repeatedly been caught manipulating gold prices. And financial companies have been caught pretending they have assets which they don’t. And gold bars have been found to have been filled with cheaper metals.